In the trendy South Manchester suburb of West Didsbury stands an early 20th century red brick church that is the ivory tower of British climbing - the BMC office. But what goes on inside this mysterious building? Dave Turnbull, BMC Chief Executive opens the door and steps inside. I first stepped foot on this hallowed ground long ago in November 1996, when interviewed for the Access Officer post. I’d stayed in a B&B in Hathersage the night before - it turned out to be right next to the village clock tower and I’d lain awake with the chimes, to get up feeling like I’d just had a hard night clubbing. There was to be no respite, the interview was a whole day affair - the BMC it seemed, was picky about who it took on. My lasting memory is of a scary looking Andy Perkins - one of the interview panel - sitting next to me, asking a single question then spending the next 45 minutes not saying a word, trying to out-stare me. Luckily Andy has since moved on to a career as a Mountain Guide in Chamonix, leaving Human Resource issues behind him. There was also one of those embarrassing “mingling style” lunches. Eugh. I remember chatting to fellow interviewee and South Devon guidebook writer Nick White, when the chair of the panel strolled over and went straight for the jugular with the old chestnut, “are you in the Climbers’ Club?” Fortunately I’d joined some months earlier (to get a hut key) so was able to squeak out a positive reply. He then turned to Nick and raised an eyebrow only to receive a slightly apologetic shrug of the shoulders and shake of the head. The rest, as they say is history. If you’ve got to work in an office, then I guess there are worse places than the BMC - not that I can actually think of any at the time of writing. And today the office houses 24 full-time staff, a resident west highland terrier called Buxton and a regular flow of hardened climbers and walkers attending meetings on access legislation, bolts, finance, climbing competitions and host of other matters of state. We have come through the “hard years’” of financial difficulties of three years ago, and (fingers crossed) the organisation seems to be in pretty good health these days. The BMC moved to Manchester back in 1975. After 30 or more years based in London, it turned its back on Knightsbridge (a prime location just opposite Harrods apparently) to set up camp in the grime and crime of central Manchester at the notorious Precinct Centre. Luckily I never visited that office, although I have heard the stories. Pete Broadman chasing off local youths caught breaking into the premises; BMC staff being shot at by high-powered air rifles through the office windows; cars broken into and left propped up on bricks; Ken Wilson chairing the Climbing Walls Committee; Denis Gray running the show as General Secretary - the list goes on. From those heady days the shift to West Didsbury must have come as some light relief. The deal was done in 1995 during Derek Walker’s reign as General Secretary - although it almost stalled when the manager of the Kwik Save supermarket next door was shot dead on the premises in broad daylight by a local nutcase. The anniversary is still marked by a wreath on the street to this day. Fortunately that particular nutcase is long gone, and the property boom of the last decade has seen the neighbourhood transform into a bustling mix of pseudo trendy boutiques, arty furniture shops, Asian eateries, pubs and stylish flats. It was a clever spot to land, and at the very least means there are plenty of eating and drinking options for staff and volunteers. It also means that the BMC has saved this pleasant little church from the ubiquitous urban fate of being carved up into yet more apartments. On first visit to the office, many people are surprised by the airy lightness, and the number of staff who work here - in fact I’m sure the image of the BMC being run by two beards in a box room is still firmly stuck in many people’s minds. And it is a far cry from 20 or 30 years ago, in the days before the internet, cheap flights or the media popularisation of extreme sports. But you can’t turn back time, and essentially the BMC has grown and developed to meet the demands of climbers, hill walkers and mountaineers and to ensure that the broad, er, church of activities we encompass are adequately represented. Of course, some people still grumble about the way we have changed, the committee structure, the size of the workforce and a myriad of other aspects. My answer to that is that compared to many other National Bodies of Sport, the office is in fact a pretty slick and lean operation. Of course there is always room for improvement. We know from the recent Future Policy Review that we must improve our support for the areas and volunteers. And our presence in the national media and profile with Government as a campaigning body needs a bit of attention too. All of these issues are being addressed as we speak through a combination of high calibre staff and volunteers working together for the common good. And finally, because it can be difficult for people to connect with what goes on up here we’ve adopted an ‘Open Door’ policy - feel free to drop in any time. Don’t expect to see any suits around these parts however; teva’s, shorts, T-shirts and fleeces tend to be the order of the day. So if you’re ever in the area and need to renew your membership, take out insurance, or simply want to grab a member of staff and bend their ear about something, then don’t hesitate. Ring the doorbell and come on in! Some weird and wonderful people have worked at the BMC. Tony Ryan takes a look at just some of the (more famous) characters who have graced the BMC office with their presence over the years. Dennis was appointed as the first professional officer of the BMC, and became its first General Secretary in 1974. Having steered the organisation through many crises and successes, he retired in 1989. Since then he’s written a number of books including a biography, Mountain Lover, two books of stories, Tight Rope – the fun of climbing and Slack, and a book of verse, Poems from the Edge. His latest book is Todhra, his first novel, and is a first in the world of climbing fiction: a novel with a gay central character. Replaced Dennis Gray as National Officer. Mountains of BMC bureaucracy didn’t stop him from climbing Everest and Changabang whilst in post. On the latter he formed his renowned climbing partnership with Joe Tasker, and wrote about the expedition in The Shining Mountain. Left to become Director of the International School of Mountaineering in Switzerland. Disappeared on Everest with Tasker in 1982. Like his predecessor as National Officer the mercurial MacIntyre simultaneously left his mark on the BMC and the mountaineering world, and likewise left the organisation to spend more time in the mountains, in particular to pursue lightweight Himalayan climbing alongside the leading Polish mountaineers of the day. Climbed the eponymously named route on the Grandes Jorasses in 1976 with current BMC Deputy CEO Nick Colton. Killed in 1982 by stonefall whilst attempting a new route on the south face of Annapurna. “Squawk” was the BMC’s first Technical Officer, a position which helped him to become a world authority on climbing walls. Moved to Bendcrete, where he was responsible for the design and construction of some classic walls, before transferring to Bendcrete’s arch enemy, Entre-Prises. Now runs Climb UK, an indoor climbing centre in Rochdale. Another National Officer who found the pull of the big mountains irresistible, Andy was renowned for his positive attitude and enthusiasm. Climbed Chogolisa in the Karakoram and Menlungtse (with Bonington and Hinkes) in the Himalaya, which he wrote about in Coming Through. Co-authored Himalaya Alpine-Style with Stephen Venables, which was published after Andy’s untimely death in a climbing accident on Lochnagar’s Eagle Ridge in 1992. Braveheart Bill was the BMC’s first full-time Access Officer, and has remained a staunch campaigner for freedom since his departure, with roles as Campaigns Officer for the Cairngorms Campaign and currently as a Director of Rural Scotland, Scotland’s countryside champion. Also writes a column on access and the environment for Climber magazine. Joined the BMC as Training Administrator and MLTB Secretary and oversaw a series of mountain training reforms and initiatives including the establishment of the United Kingdom Mountain Training Board. In1996 the BMC and the Training Boards established the Mountain Training Trust, to manage Plas y Brenin, and Iain became its Chief Executive, a position he filled with considerable success for a decade, having stepped down this month “to spend more time in the mountains” - where have we heard that before? 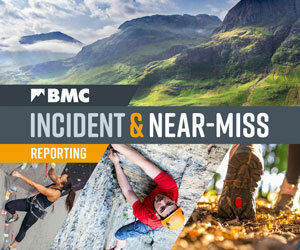 Former BMC Vice-President Derek left a career in teaching to succeed Dennis Gray as General Secretary, and steered the BMC through a period of unparalleled growth in climbing and mountaineering and demand for BMC services. He then came back for more punishment as President from 1999 to 2002. Now retired and still a keen climber, he can often be found in Morocco, putting up new routes with Chris Bonington, Joe Brown and other climbing legends. Teamed up with Iain Peter to tackle the mountain training reforms, both moving from the Manchester office in 1991 to set up a Mountain Leader Training Board office at Plas y Brenin. Now Executive Director of Mountain Leader Training UK (MLTUK), formerly UKMTB. Heavily involved in the outdoor activity sector’s response to the controversial Working at Heights Directive. Northumberland activist Hugh Harris was the BMC’s first Competitions and Climbing Walls Officer. Hugh moved on from the BMC to manage the Leeds Wall and now works for Mountain Works, an outdoor equipment agency. Kath joined as Access Liaison Officer and provided great impetus to the BMC’s work on access and conservation. Left the BMC for a move to the USA, where she put her BMC experience to use working for the Access Fund, keeping climbing areas open and conserving the climbing environment. Now works for the American Alpine Club as an archivist. Member of a number of successful all-female expeditions to mountains with the likes of Louise Thomas, Kate Phillips, Glenda Huxter and Celia Bull. Ian was the first Regional Development Officer, based in the South West at the Bristol Climbing Centre, and covered all areas of BMC work but at local level. Ian eventually decided to give up the cream teas and the meetings, and establish himself as one of Britain’s leading alpinists. With significant ascents around the world, Ian also developed a reputation as a photographer/cameraman. Ian was recruited to film Sir Ranulph Fiennes’ attempt on Everest last year. When Ran had to turn back on summit day, Ian thought it would be a shame to waste the opportunity, so promptly bagged the Big One. The first of the Arran dynasty to work at the BMC joined as Development Officer. Multi-talented and super-fit, amongst his many impressive climbing achievements, he is probably the only climber to have soloed 500 grit routes in a day. Writes both a monthly alpine climbing review for Climber magazine, and complex computer programs for the UN! Dynamic National Officer under Derek Walker, promoted to General Secretary when Derek left. Roger gave sterling service to the BMC whilst also managing to arrange an expedition to the Greater Ranges most years. Left the BMC to take up a development role at the UIAA, mountaineering’s international federation. Now guiding from a base in the Swiss Alps. Larger than life National Officer famed for introducing many of today’s young hotshot mountaineers to the Greater Ranges. Eventually lost his perennial battle with his waistline and gave up climbing. Successfully gained an MBA and now works as a large Small Business Advisor in the Rossendale valley. Youth became a strategic priority for the BMC in 1997, and Anne joined as Youth & Training Officer, to provide support and advice for a new generation. Still involved in climbing politics as President of the UIAA Youth Commission, and covers the competitions circuit for Climber magazine. Last year made the first ascent of a new route on Venezuela’s Angel Falls with husband John, Miles Gibson and Ben Heason. BMC Specialist Committees: what do they do? Much of the work of the BMC is overseen by specialist committees made up of volunteers with relevant skills and experience, who guide the work of BMC staff. Find out more about what these committees do, and how you can get involved. Where is Bill Wright these days?